On September 21st the Maywood Station Museum will celebrate its 10th year anniversary at its Annual Railroad Day event from noon to 3pm. The museum first opened its doors on September 25, 2004 when it hosted a Grand Opening that was attended by many dignitaries including members of the television and print media; the historical community; U.S. Senators, State Senators; members of the NJ State Assembly, Bergen County Freeholders; the Bergen County Executive; and others. In the last 10 years, the Maywood Station Museum has grown to see an average of 2500 visitors each year during the seven or eight open houses and events that the museum hosts each year between April and December. Admission has been free since its inception and the museum survives solely on visitor donations, sales from items in its gift shop and the hard work of its volunteers. However, for as successful as the museum has been the past ten years, the plight of the station itself has not always been so rosy. Originally built in 1872, Maywood Station served as a stop on the New York, Susquehanna & Western Railroad until 1966 when passenger service ended. The station went relatively unused in the 1970’s and began falling into disrepair until 1979 when Maywood’s Veterans of Foreign Wars Post #7408 leased the station as a meeting hall and performed necessary repairs. The VFW continued to lease the station until 1992 when the station once again began to fall into disrepair as the railroad searched for a new tenant. By 2002, the station had fallen into such a sad state that the Borough of Maywood signed a demolition order. When it was reported in Janet Hollenbeck’s article in the early May issue of the Our Town Newspaper that the station was threatened, a group of concerned local citizens led by Ed Kaminski united and formed the Maywood Station Historical Committee (MSHC) on May 29, 2002 in an effort to save the historic station, which at the time was the fifth oldest station in the State of New Jersey. On June 20, 2002, the MSHC aligned and became a division of the 501(C)3 non-profit New York, Susquehanna & Western Technical & Historical Society, Inc. and formal fundraising and restoration of the station began. The volunteer restoration continued on by MSHC members for twenty-seven months culminating with the Grand Opening of the Maywood Station Museum on September 25, 2004. All of the work was not going unnoticed either. The restoration was receiving constant attention in the press and the MSHC was being recognized from many different channels. To date, the MSHC has earned thirty-seven different awards, commendations and resolutions ranging from the United States Senate to the highly coveted State of New Jersey Preservation Award. Only sixteen different organizations in the history of the State of New Jersey have ever achieved this award. The MSHC even earned a documentary film award from the Bergen County Division of Historic and Cultural Affairs for its DVD “THE MAYWOOD STATION STORY“, which was produced by MSHC member Matthew Greco, written by MSHC member Ed Kaminski with cover photography and design by MSHC member Robert Pisani. The documentary was narrated by Carl Quintanilla of NBC-TV. 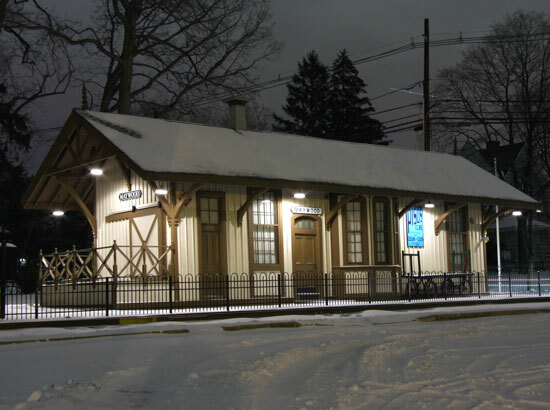 In 2010, the book, “MAYWOOD – THE BOROUGH, THE RAILROAD, AND THE STATION” written by Ed Kaminski was released by Arcadia Publishing worldwide and features a full chapter about the restoration and museum. The museum, to no surprise, features a lot of local railroad history, artifacts and photographs. Sprinkled in is some town history to keep things in context. Some is from members own collections like Ed Quinn’s steam whistle, various lanterns and cap badges worn by train conductors from a century ago. A steam engine headlight is lit inside the museum, which is also from Quinn’s collection. The museum is open from April to December each year starting with the Annual Meet the Easter Bunny event and concluding with the Annual Santa at the Maywood Station event. The museum is closed to the public during the winter months. Each year there are open houses and special events, which have included free concerts in the summer months. Founding MSHC member and Treasurer Robert Pisani commented, “we have a great relationship with several Maywood businesses and organizations. Park Ave BMW supports our annual Santa event each year, Park Ave Acura has sponsored our Maywood Station Museum Backyard Free Summer Concert Series; Myron Corp. continues their involvement with our annual holiday ornament; and Moon Doggie Coffee Roasters helps out and serves refreshments and snacks when the museum has larger events.” School class trips and visits by local scouting troops are regularly arranged each year as well. The current MSHC membership remains stable from age 21 to 76 with approximately twenty-five members pitching in wherever necessary. Happy 10th Anniversary, Maywood Station Museum!